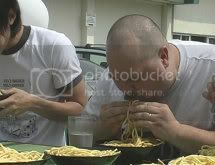 And on October 27, 2007, here in NYC (again) they’ll be covering the noodle-eating contest to end all extreme carbohydrate-stuffing contests, as nine competitive eaters battle it out to be named the MLE "Ramen-Eating Champion." In preparation for this event, New York restaurant, Tokyo Lamen, is cooking up 110 1-lb. bowls of fresh noodles and broth. The contestants will be required to use chopsticks, in keeping with the traditions of Japanese eating contests. And speaking of Japanese traditions, it's all part of a promotion for a new Nintendo Wii game called Naruto: Clash of Ninja Revolution . Hence, the official title of the contest: 2007 Naruto Wii World Ramen Eating Championship. If you want to catch this particular gorgefest, it's at 11:30 A.M at the Nintendo Store at 10 Rockefeller Center. Chopsticks, Noodles, and digestive tracts...oh, my! What would it be? And, what would it be like? Vanity Fair photographer, Melanie Dunea, has come up with a "picture perfect" way to ask these questions of fifty of the world’s most famous chefs. Dubbed as "Annie Leibovitz meets Heat," in her new book, My Last Supper: 50 Great Chefs and Their Final Meals/ Portraits, Interviews, and Recipes , Dunea showcases their fascinating answers alongside stunning Vanity Fair—style portraits. Their responses are clever, refreshing, and as distinctive in their individuality as each of these chefs in their own right. The intimate portraits are strongly supported by their answers and reveal the passions and personalities of the most respected names in the business. As an added bonus, one recipe from each landmark meal is also included in the back of the book. 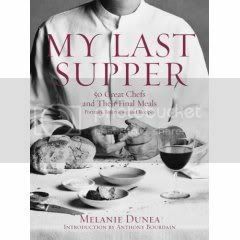 With My Last Supper, Dunea found a way into the typically harried, hidden minds of the people who have turned preparing food into an art. Who wouldn’t want to know where Alain Ducasse would like his last supper to be? And who would prepare the final meal for Daniel Boulud ? What would the guest list of "extreme-eating" chef and world traveler, Anthony Bourdain look like? As the clock ticked, what album would Gordon Ramsay be listening to? And just what would Mario Batali eat for the last time? Inquiring minds, will find out. Marcus Samuelsson, Charlie Trotter, Jean-Georges Vongerichten, and more. Click here for the stellar My Last Supper Book Launch Party held at Le Bernardin. *Note* The Lenny Karvitz look-alikes are killer. Buying the bottle is fine, but how about buying…the vine? 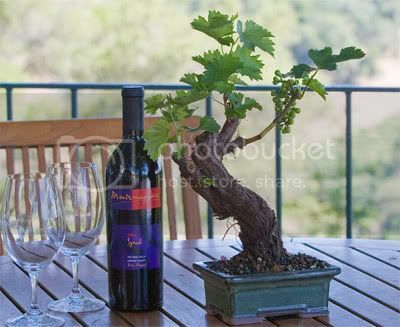 Well, now you can actually own your own Bonsai Cabernet Sauvignon Winegrape. This beautiful vine also comes in an attractive ceramic container. All vines are 10-12 years old and come from Sonoma County. So own a little piece of the beautiful Sonoma Wine Country, watch it grow, then harvest your own wine grapes. Sweet deal, no doubt. And, directions for taking care of your vine come with the shipment. 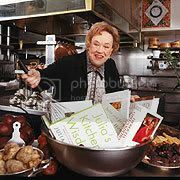 Take a short trip with American icon and mistress of French cuisine, Julia Child, as she visits the Library Of Congress to explore the origins of early cookbooks such as the compilation of Thomas Jefferson's recipes while living in France, and the first French "Singing" Cookbook. And only she could make a trip like this -- sound totally interesting.